WBRC Architects Engineers is 117 years young this year. As we travel in our communities in Maine, Florida, and beyond, it’s an honor to see examples of our firm’s design work – some going all the way back to 1902. 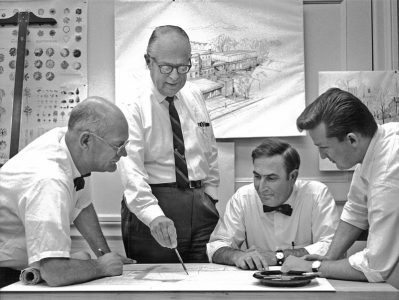 Like many legacy architecture and engineering firms, WBRC Architects Engineers went through many name changes as partners joined or departed. Here is a brief history of WBRC’s name changes and branch openings. Two former engineering classmates from University of Maine class of 1898 gain some experience and AIA certification in Boston, then move to Bangor to start their own design firm. During their first year in business, these two 26-year-old architects designed three schools, three churches, seven homes, a hotel, a store, and two apartment buildings, among other projects. 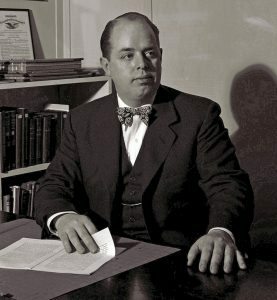 John F. Thomas returned to Boston in 1905; C. Parker Crowell went on to lead the firm for the next 54 years, retiring at age 80. After John F. Thomas departs, Crowell renames his business and hires Walter Lancaster. When the Great Fire of 1911 took out most of downtown Bangor, the two of them designed many of its new buildings, including the Kirstein Block, where WBRC’s headquarters is today. Walter Lancaster becomes a partner and spends the next 37 years working with C. Parker Crowell on hundreds of buildings, including 44 buildings on the University of Maine campus in Orono. Lancaster, like Crowell, will work at the firm until age 80. 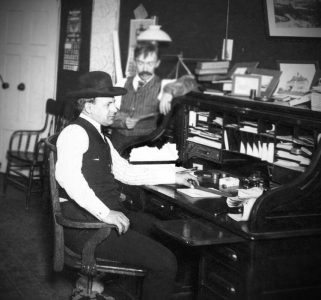 Ambrose Higgins, son of architect E. Leander Higgins, visits his father’s friends Crowell and Lancaster, and is invited to join the firm. 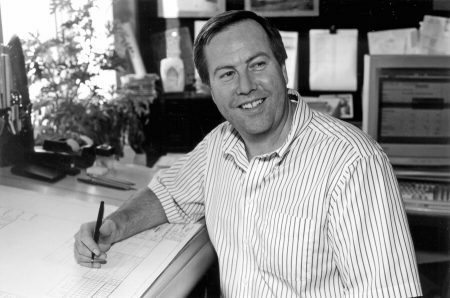 In addition to being Maine’s third licensed architect, he is elected to the American Institute of Interior Designers. 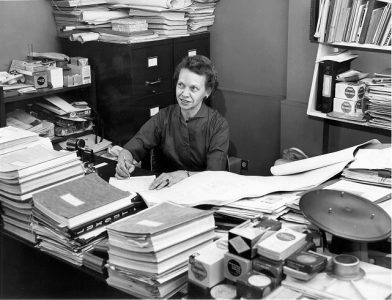 Gertrud Ebbeson, one of the first women to earn a degree in architecture from MIT, joins the firm the same year. 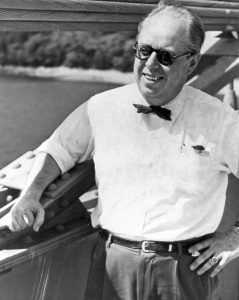 Edwin Webster, a civil engineer, was recruited from a respected local competitor, Eaton W. Tarbell. 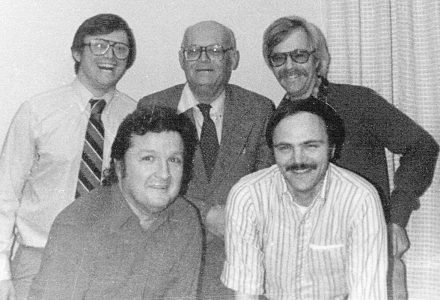 Webster became a partner the same year C. Parker Crowell retired with over 1,000 buildings to his credit. In 1957, a high school student name Skip Day begins his climb from print boy to principal. 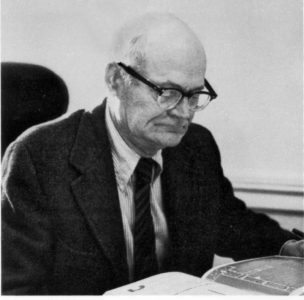 George Lloyd joins the firm for two short but productive years, designing a college dorm, a Catholic church, and a local YMCA during his tenure. After George Lloyd leaves the company, Higgins and Webster know they need to plan their succession. Ambrose Higgin’s death in 1971 makes it even more urgent. 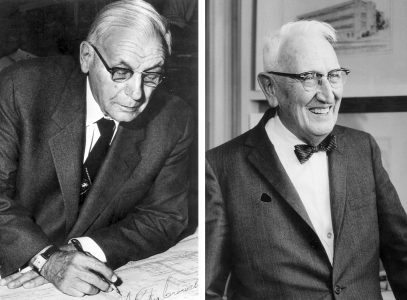 Fortunately, three talented architects were ready to assume leadership roles. 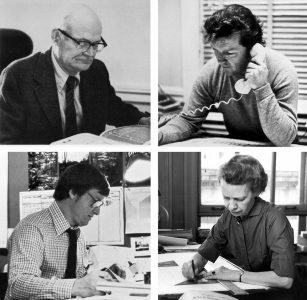 As the new sole owner, Ed Webster approaches three architects on his team, Gertrud Ebbeson, Herb “Skip” Day, and newcomer Alan Baldwin, with an offer of ownership. All three accept, and “associates” became “partners.” Gertrud is among one of the first female A/E firm principals in the state of Maine. 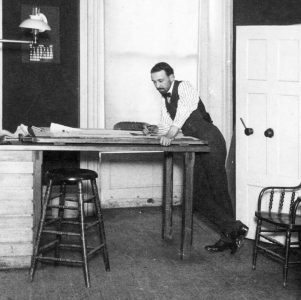 That same year, Webster proves his mettle by becoming a licensed architect as well as an engineer. Wishing to give all its owners recognition, the firm name is changed to Webster / Ebbeson / Baldwin / Day in 1974. After Gertrud Ebbeson retires, a civil engineer named John Rohman is offered an ownership position. Rohman would go on to serve the firm 38 more years, 20 of them as its CEO. Like many of his predecessors, John Rohman stays highly involved in community service. He also keeps another firm tradition, gaining a second professional expertise. His is Interior Design. The firm’s longest name also ends with the toughest name to pronounce: Czarniecki. 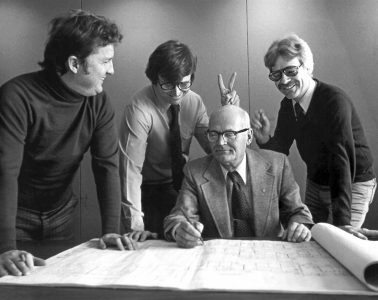 (Pronounced CHAR-neh-key), after architect Mike Czarniecki, who had become a partner in 1981. Though Ed Webster had retired in 1987, his name had too much brand cache to remove from the firm’s moniker. For its 10th name change, the owners of Webster, Baldwin, Rohman and Czarniecki (with Al Bromley and Steve Rich now principals) decided to shorten the firm’s name to just initials: WBRC. Since then, subsequent owners have chosen to stay with the name WBRC Architects Engineers. 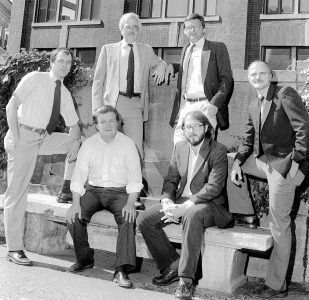 It’s probably for the best: Otherwise, the firm’s name today would be Whitney / Frank / Bolduc / Brody / Borrelli / Pogar / Adcock / Kowal / Monyok / Johanning / Monroe. Principal Doug Whitney expresses interest moving to a warmer climate. Rather than lose this gifted and prolific architect, his partners ask him to found a WBRC branch in the Florida location of his choice. He chose greater Sarasota, a beautiful and economically vital area on the state’s Gulf Coast. Doug and his team set up shop in Lakewood Ranch, one of the country’s most popular and fastest growing master planned communities. With much of Maine’s economic development happening in the southern part of the state, a branch office in Portland seemed a prudent step. WBRC’s Portland location soon proves essential when the firm landed one of largest jobs in its history, the renovation and expansion what is now Cross Insurance Arena. 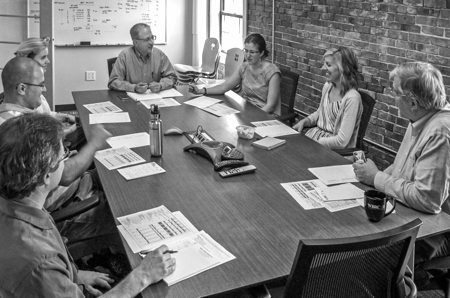 WBRC’s Portland branch allows the firm to efficiently provide solutions to clients in neighboring states, as well as continuing to serve the great state of Maine. WBRC Architects Engineers now employees over 50 people in three offices, and is owned by twelve principals. In recent years, our work has taken us to 28 states and the Canadian Maritimes. Technology allows WBRC project teams to share resources among three offices, to partner seamlessly with niche design experts, serve clients from Canada to Texas, and to attract talent from all over the globe.